Max is the newest addition to Harle’s deck department and he is thrilled to be back on the water. 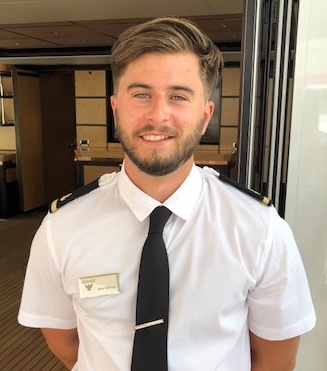 Max started yachting at the age of 18 when on holiday in the beautiful island of Antigua, he was offered the opportunity of a lifetime to work on a 46m sailing yacht. He then sailed across the Atlantic Ocean to the Mediterranean and ever since then has gained a passion for the sea. Max’s sea time is not only of professional experience; he has taken recreational expeditions, including a trip on a sailboat around Norway with his friends. Prior to yachting, Max studied sports in England. He was even offered a scholarship to run cross-country. Exercise and sports have always played a large role in Max’s life, he was even captain of his football team for 6 years. Max also calls Barcelona home. He and his family relocated to the Spanish city when he was 17. While in Barcelona in 2017, The Harle crew luckily had the opportunity to have Max “day work” for several weeks during the busy shipyard period. After seeing what a hardworking and dedicated person Max was, we knew we had to have him back on board.